The great thing about Ames is that almost every place you’d want to go in town is doable by bike. Distances aren’t daunting, there are no huge hills, traffic is generally light and amenable, and by the time you account for parking time the time you spend on your bike is roughly equal to the time you spend in your car. Thus, you’re not burning gas or adding (much) carbon dioxide to the air and therefore have the official bike commuters’ license to be tiresomely smug and self-satisfied. What does it take to commute by bike? Well, in terms of actual needs, very little: a bike with two semi-round and semi-inflated tires is about the limit of “need” (unless you plan to ride in the dark, in which case you legally and Darwinially need lights). There are lots of things, though, that make commuting nice. A bike that allows you to be a little more upright allows you to see traffic… no road bikes, please. The Beast is only a partial compromise to this as I have him set up in what I call a “semi-aggressive” position. The difference is how much the wind is going to hit you as you ride. Lower = better against wind. Higher = better against traffic. Living in Iowa you play with the wind a lot, and since The Beast is my commuter/rando/’cross/whatever bike, I’ve got him comfy as my jack-of-all-trades bike. If you plan to commute in anything but the best weather fenders are a really good idea. There’s a reason motorcycles almost always have them. The one in front does the most in keeping you dry, and the one in back keeps the “inverse skunk”/racing stripe o’ dirt thing from the back of your shirt. Also when you finally convince your friends to commute with you fenders will keep them from literally eating your dust. Get them. Unless you carry nothing back and forth from work you need something to help you convey your crap. If you want to be at the cutting edge of fashion you can use a messenger bag, but be sure to get the extra strap that keeps the bag from rotating around your body and bouncing on your knee like a formless ballistic nylon baby. 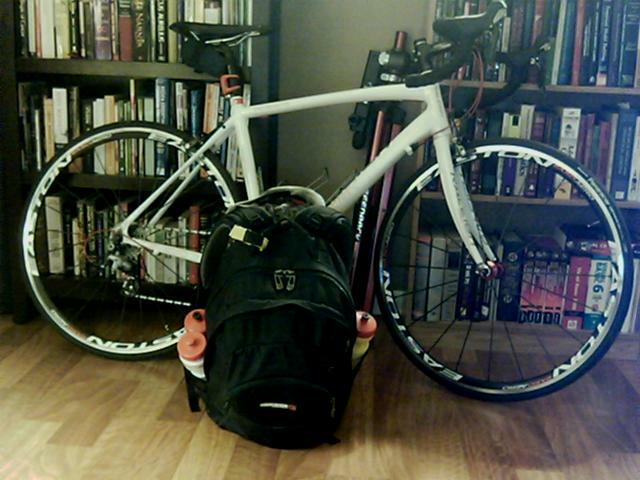 Backpacks work well, too, but you can’t access them while you’re riding unless you’re exceptionally limber. This is the main BS reason people give for using messenger bags. If you have to carry a lot of stuff, get a rack for your bike. It keeps stuff off your back (saving lots of sweat & heat when it’s hot), and they’re very versatile. You can carry a small racktop bag when you need essentials or go the whole hog with panniers (saddlebags) that can carry lots of stuff but do sit out in the wind. Helmets are up to you. The one really major crash I had gave me a pretty serious concussion, and I was wearing a helmet. I was, realistically, going pretty fast (too fast for the turn in the weather conditions) even though I was commuting at the time. If you go slower or are a little less rash than I am concerning turns at speed you can probably spend your whole life not wearing one. How long that life is, though, may still depend on whether or not you’re wearing a helmet. To be fair, people in most countries that make cycling a part of daily life don’t do the helmet thing, but they also have traffic that’s used to bikes and infrastructure designed with bikes in mind. Here it’s a little different, but ultimately it’s your brain and your choice! Weather is perhaps the hardest thing to deal with, especially with new bike commuters. The really neat thing is that it is almost never too hot to ride a bike. Biking creates wind as you move through the air, and as long as you’re properly hydrated your sweat will do an amazing job of cooling you down. Cold is more problematic, since you’re creating wind. I generally will commute down to about 10° F (-12° C), but I layer and layer and LAYER!!! At that temp, with the wind you’re creating, you really need to cover every little bit of exposed skin. scarves, hats, balaclavas, face masks, gloves, bar mitts, show covers… all a hassle, but all will help keep you warm. Places with real winter usually do a good job of cleaning up roads and paths, but snow tires with studs (spendy) or aggressive tread patterns (not as spendy) are a huge help. There… you know everything I know about commuting. throw on clothes. Throw a leg over your bike. Ride to work. If you commute by bike rather than by car 4 days out of the month, that’s 4 more days that month that you got exercise, without even trying hard! You’ll be amazed at how quickly you, like me, become tiresomely smug and self-satisfied!